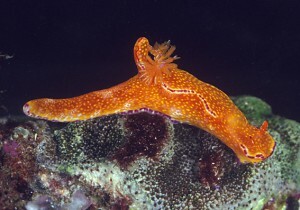 An attractive, moderately large (50-120mm) and often-encountered shallow water sea slug. Although sometimes venturing into the low intertidal, the Purple-edged Nudibranch is most commonly found at depths of 10-30m. The projecting dorsal ‘horn’ is a site where noxious chemicals are concentrated, providing a nasty surprise for curious potential predators. This species is a sponge-feeder and lays a red, crinkled, spiral egg-ribbon.